Feng shui is a term we often throw around whilst decorating, furnishing or rearranging areas of our homes. But when understood and applied properly, the positive effects of feng shui in the home can be profound. From its Chinese origin translating as fēng ‘wind’ and shuǐ ‘water’, feng shui is defined as ‘the system of laws considered to govern spatial arrangement and orientation in relation to the flow of energy’. Check out these bedroom ideas on how to use feng shui to create a more relaxing, sleep-promoting environment. One of the principle ideas of feng shui concerns the relationship between light and energy. When drawing up the plans to your home, ensure that the placement of any windows allows for natural light to shine in. This can create a stronger sense of openness and positive energy in a room. When thinking up new bedroom ideas, a colour overhaul is often the best way to rejuvenate a room. The laws of feng shui infer that the colour and position of a bedroom in the home can attract different kinds of energy. 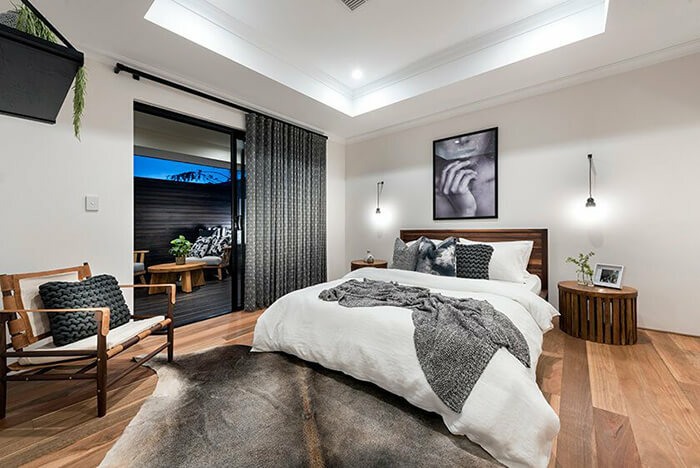 A bedroom in the west area of a home, for example, may be painted in earthy tones to attract creativity, whereas a bedroom in the southeast of the home in the same colour may attract wealth. Cool tones can be soothing, with neutrals, greens, and blues are seen as conducive to relaxation. It is recommended to avoid stark white tones, which are thought to be too mentally stimulating, especially at night. It is advised, also, to avoid dark colours in the bedroom which can evoke a sense of imbalance. The application of feng shui to the positioning of furniture in the bedroom can create a sense of openness and positivity. According to the laws of feng shui, the positioning of your bed can have a profound effect on your quality of sleep. It is advisable to position your bed against a solid wall as opposed to under a window to avoid any distraction from the outside world. The placement of your bed in relation to your door can also be a factor in promoting good quality sleep. The ideal position for your bed is diagonally from the door but not in line with it. We generally feel safer when we can see the entrance to the bedroom. The rules of feng shui also advise that mirrors should not be placed in the bedroom. A subconscious awareness of your reflection in a mirror near your bed could be the cause of a low-quality sleep. And finally, advice we all know we should listen to… remove any electronics from the room! Computers and televisions symbolise wakefulness and can be a drain on energy! Leave them downstairs and get a good night’s sleep! Whether you’re drawing up house plans or renovating for better feng shui, iBuildNew can advise you throughout your project. Book a call with a member of our team today.